We are in the midst of the hottest part of the summer in Central Texas; your body is working hard, and it’s essential to replenish all the vital nutrients it needs! Omega fatty acids can help lower the risk of heart disease, lower blood pressure, fight against depression, dementia, and arthritis. It’s important to remember that our body cannot produce them on its own; you have to consume them in food, or take supplements. The best source of omega-3 fatty acids, DHA and EPA, is in fish. High intakes of dietary nitrate, like that found in arugula, have been shown to lower blood pressure, reduce the amount of oxygen needed during exercise, and enhance athletic performance. This is great when your body is working extra hard during the heat! Consuming 2 cups of arugula will provide an intake of 20 percent of vitamin A, over 50 percent of vitamin K, 8 percent of vitamin C, folate, and calcium needs for your day. Did you know that Avocados contain more potassium than a banana? Avocados are packed with essential nutrients, and ideally should be consumed daily! Avocados also contains magnesium, manganese, copper, iron, zinc, phosphorous and vitamins A, B1 (thiamine), B2 (riboflavin) and B3 (niacin). Safe to say, in this yummy medley, you will be consuming a meal of superfoods. 2 tablespoons fresh juice from 1 lemon. Begin by prepping your dressing so that the ingredients may have time to meld together. Mince your fresh garlic, and mix into the olive oil, lemon juice, and dijon mustard. Add in the fresh dill, cayenne pepper, fresh ground black pepper, and Himalayan salt. 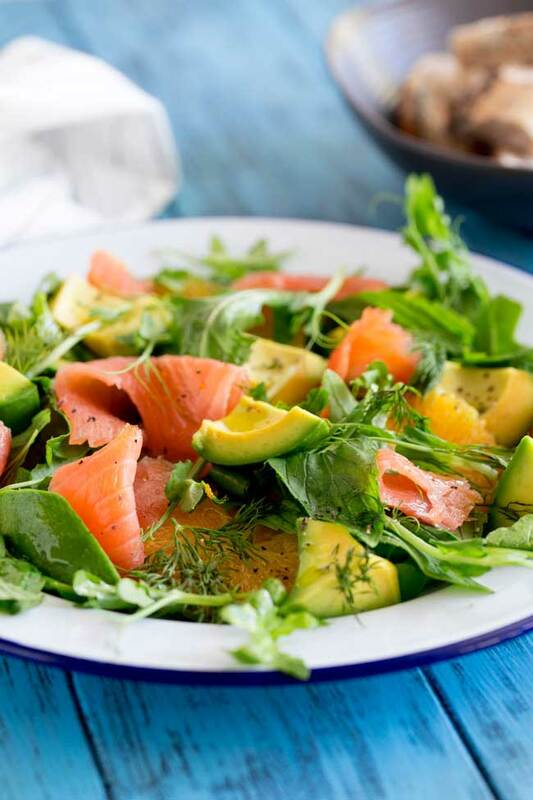 Place freshly sliced smoked salmon in a bowl, and pour the dressing over, set aside, and allow the fish to marinate. You may leave the arugula in whole leaves, or slice into smaller bites. Dice the fresh avocado into cubes, and mix into the greens. Add in the salmon, and pour the remainder of the dressing over the ingredients, stirring together.